1. I was so pleased to be able to share this post with you. It’s an interview with Allan Laville of the University of Reading, all about how children distinguish between fantasy and reality. His work is utterly fascinating, and if you didn’t catch the interview first time round, here’s your second chance. 2. Following the departure of Amanda Craig from The Times, I wrote about the marginalisation of children’s literature. The full post is available here. 3. Read Your Way Around The UK launched this year! It’s a project that involves finding a book based in every county of the UK. You can read the introductory post here and view the current spreadsheet here. England’s done, and I’m working on the others! 4. In August, I found out the truth about Anne from the Famous Five. You can find out what I mean here. 5. And finally, there’s the post where I told you all some exciting behind the scenes news about me and that. Do you remember that whole mad ‘can you read your way around the UK’ idea? We got England completed! Thank you so much if you’ve been a part of this! You can view the current state of the spreadsheet if you click on the below image. Which, coincidentally, is all the England titles and authors word-cloud-i-fied. You can also see a map of all the books in England here! @yayeahyeah: “Skulk” Rosie Best and “The City’s Son” Tom Pollock. NB: This reflects the titles at point of posting. 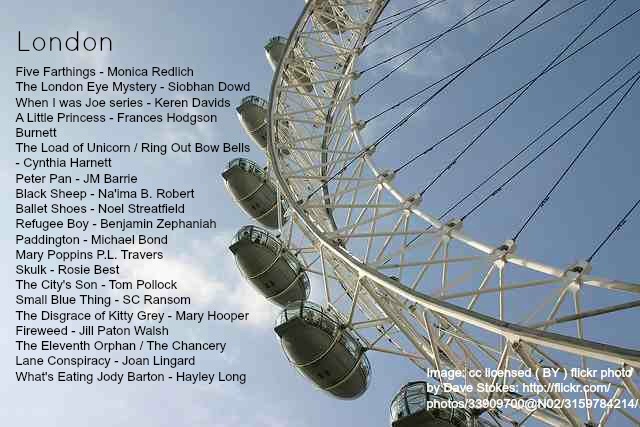 For the most up to date list of books set in London, please view the #readyourwayaroundtheUK spreadsheet.